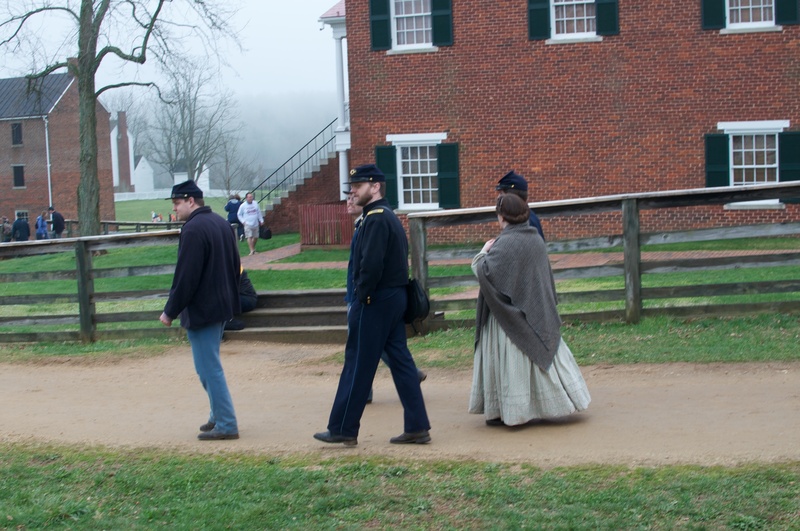 I have had the opportunity to attend two very moving, historical reenactments in my life. Both were done in real time with exact detail. The first was the bicentennial reenactment of George Washington’s funeral at Mount Vernon in December, 1999. 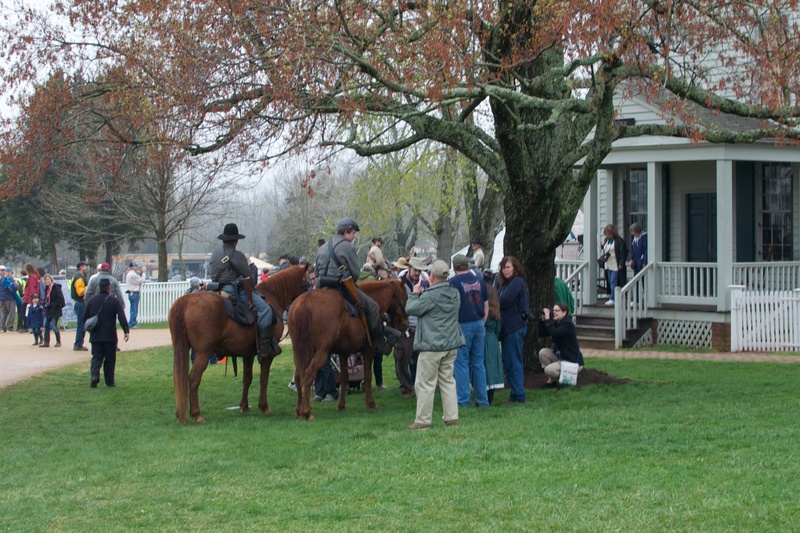 The second was on Thursday, April 9th, 2015 at Appomattox Court House, Virginia where the National Park Service had a minute by minute program marking the surrender of Lee to Grant at the McLean house marking the end of the Civil War in 1865. 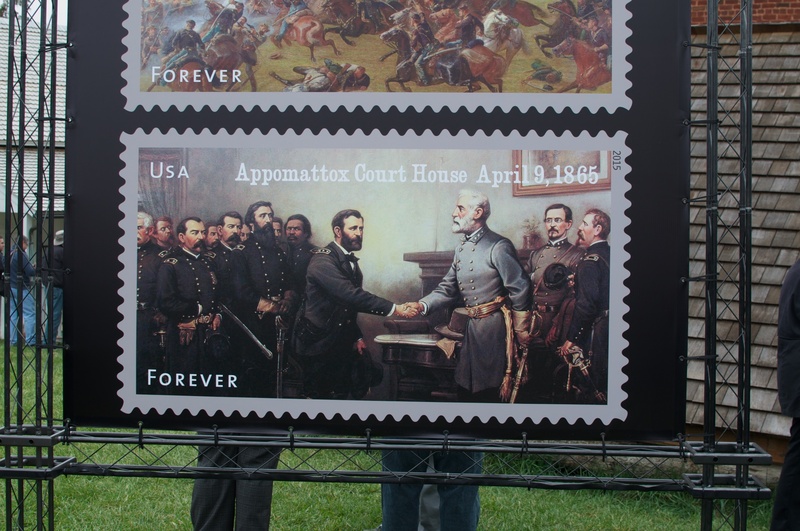 After a stamp ceremony for the Appomattox and Five Forks stamps “Grant” rode up to the McLean house on horseback with his Generals. They entered the house where “Lee” had been waiting. 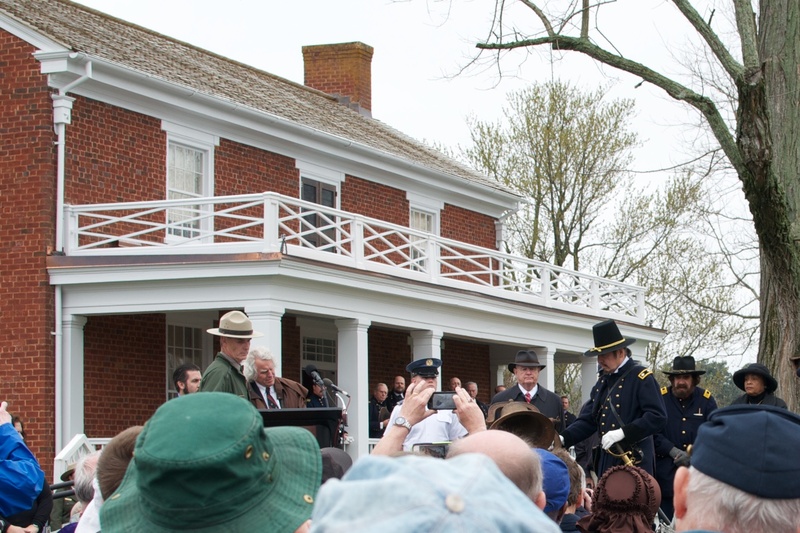 During the hour and 15 minute meeting the Park Service presented various historians to explain what led to the surrender, what was happening during the surrender meeting, and what it meant for the preservation of the Union. Lee then emerged from the house and turned and tipped his hat to Grant and his Generals. They returned the favor and Lee rode through the town on his horse. The ceremony ended with the ringing of a bell, four times for each year of the war. In a program called “Bells Across the Land” various bells including the Liberty Bell in Philadelphia, the bells in the Old North Church in Boston, and others across the nation would be rung at 3:15 PM EST to mark the end of the Civil War. The Bradley family and related families had many soldiers in the Civil War on the Union side. Henry Martin Bradley’s oldest daughter Alice was married to Guardis D. Edwards who served in the 4th Michigan Cavalry and died in 1878 of consumption contracted during his service in the Civil War. George W. Hoover of Georgetown in Washington, District of Columbia, a recent college graduate and a First Lieutenant of the 14th Infantry was mortally wounded at the Battle of Gaines Mill, Virginia on June 27th, 1862 and died four days later. Thomas Scott Bradley, son of Eli and Amanda Bradley, joined at the age of 37 and served as Captain of a company of sharpshooters from New Lebanon, New York, where he had been preaching as a pastor, and died in the service at Philadelphia, Pennsylvania on June 28, 1863 leaving two sons. His brother, John Stone Bradley, also served as an officer in the Civil War and later settled in Bridal Veil, Oregon.